Madeira isn’t often seen as a maturation or finishing vessel for whisky. 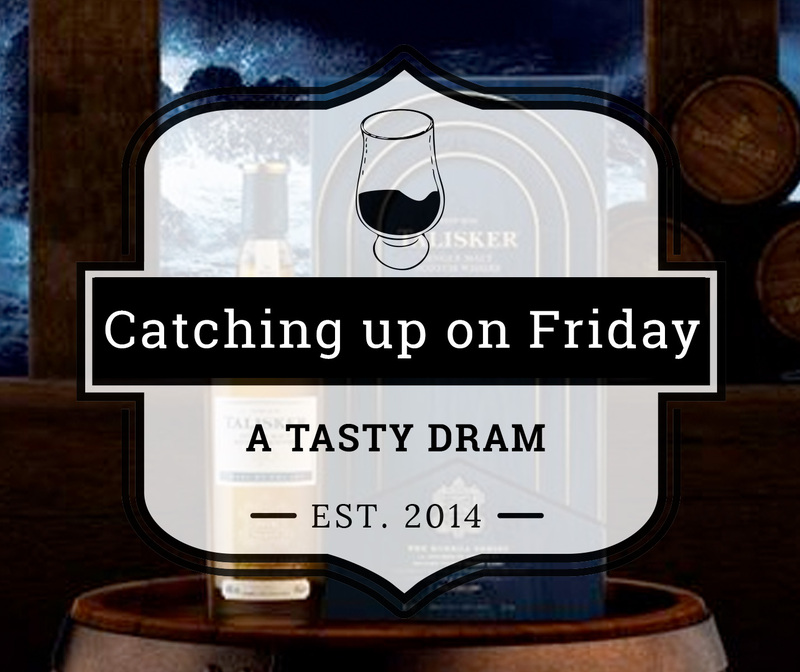 Only once in a while, you’ll encounter an ACE’d single malt or a whisky that fully matured in Madeira casks. Kilchoman had a Madeira expression in 2015. Glenfiddich, Balvenie, Benriach and Arran had one or two expressions. 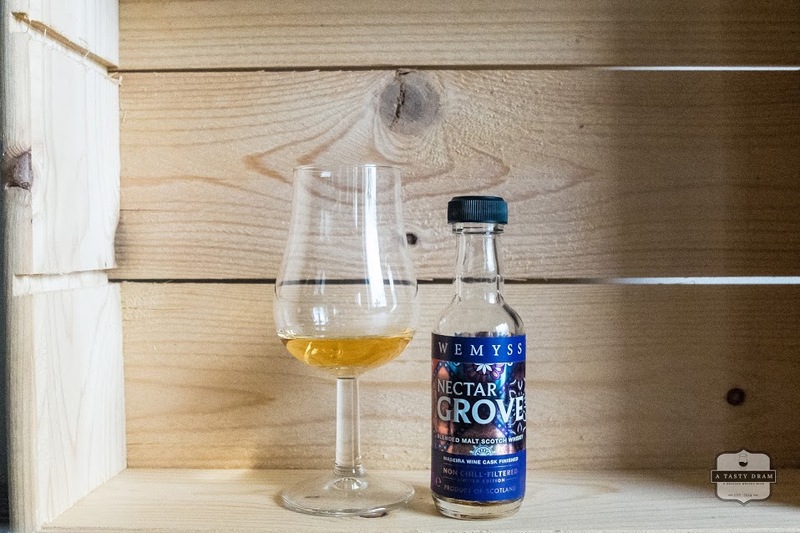 And now Wemyss Malts finished a Highland blended malt in Madeira casks. Madeira is a fortified wine that most of us only know as a sweet syrupy or the cooking grade version. Trivia: Did you know that most of those cooking grade Madeiras are preseasoned with salt and pepper and aren't meant to be consumed as a drink? Madeira wine was very popular in the 17th and 18th century. It was used to toast the Declaration of Independence of the United States. The mid-19th century was almost fatal to the wine. The phylloxera epidemic that plagued France reached the island and the end of the 19th century most vineyards were converted to sugar cane production. There’s a variety of styles unknown to most people to be discovered. Unless you’re a wine buff, but I’ll assume you don't need to read this humble and mediocre blog. Let’s start with the basics. Madeira is a fortified wine made on the Portuguese island of Madeira. It is perhaps the second most famous export product of the Islands. Brilliant yet slightly arrogant (opinions may vary) football player Christiano Ronald being the best known. The styles range from dry wines to be served as an aperitif to sweet sticky dessert wines. And then there’s the cooking grade stuff that isn’t fit as a beverage. Madeira as a wine style was discovered by accident. Back in the 15th century, the island was an important port for ships heading to the East Indies. To prevent the wine from spoiling on a long sea trip, a neutral grape or sugar spirit was added. When an unsold shipment of wine returned to the island, merchants discovered that the sea voyage had changed the flavour profile. Exposure to tropical heat and bouncing up and down on the sea waves were the key factors to improve the wine. Some people would probably argue that the casks breathed in some salty sea air too. Since sending off a ship with casks of wine to expose it to heat and movement wasn’t very viable from a business point of view, Madeira winemakers tried to mimic the heat exposure by modifying the ageing process, also known as the estufagem. The most common method, Cuba de Calor, involves heating the wine by placing it in a stainless steel vat and heating via a serpentine method. Water at a temperature between 45° and 50° Celsius is run through the serpentine system for at least three months. After the heating process, the wine is laid to rest (estagio in Portuguese wine geek speak) for 90 days. 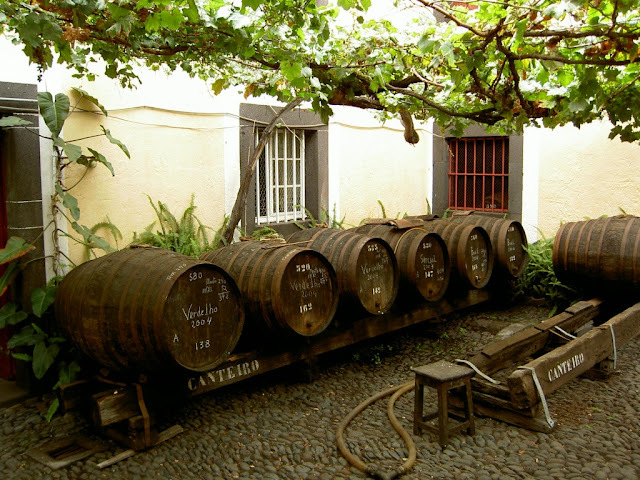 The most straightforward process, Canteiro, is storing casks of Madeira in warm storage rooms such as attics and leave them to age by sun heat. The maturation takes more time. Some winemakers claim to have Madeira that matured a century. The third estufagem method Armazém de Calor can be described as storing the wine in large wooden casks in a room with steam-producing tanks. The length of the process varies from 6 months to a year. The four major styles of Madeira are synonymous to the white grape varieties used to make the wine. Sercial is a dry and pale wine with almond flavours and a high acidity. Verdelho is a less dry and is characterised by some smoky notes. Bual or Boal is a dark wine with raisin flavours. The last one, Malvasia is known for its dark colour and coffee-caramel flavours. A fairly high acidity prevents the wine from being overly sweet. The wine labels can give you some clues on the age of the wine. Let's summarise the most common terms. Reserve: Wine that is at least 5 years old, the minimum amount of ageing for wines with at least 85% of the four main grape varieties. Special Reserve: Wines of 10 years old, often matured without artificial heat source (Canteiro). Colheita: Wines from a single vintage between 5 and 19 years old before being bottled. Frasqueira: Wines that aged at least 19 years in a cask and one year in the bottle before being sold. Finest: Wines of at least three years old. This is usually cooking grade wine. But we digressed a little bit so let's return to Nectar Grove. The whisky itself is a Highland blended malt that got a finish in Madeira casks. For the moment there isn't any info on the Madeira wines nor the wineries providing the casks. 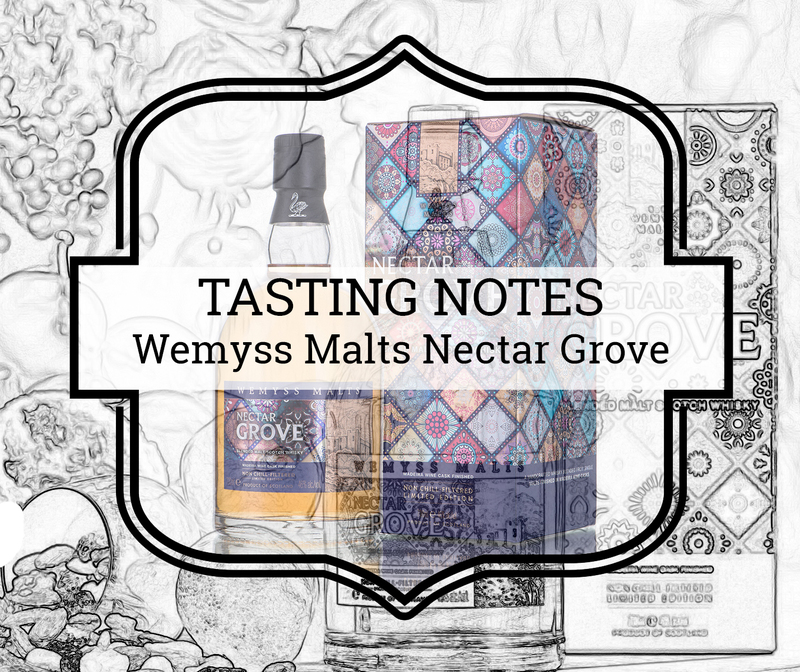 It is the first of the blended malts from Wemyss Malts with a specific cask finish. The colourful packaging was inspired by Portuguese ceramics and the name refers to the nickname of Madeira: The Flower Island. Looks: Clear gold with a slightly oily texture. Swirling reveals fast legs. Nose: The nose is fairly unique. An abundance of sweet aromas. Honey, flowers, peaches and cherries. And quite grainy too. Breakfast muesli with milk chocolate, cinnamon and raisins. Rum-raisin and butterscotch ice cream. Sweet cantaloupe melon. With water, there's more freshness. Orange and melons. Taste: The start is robust and spicy. Pepper, clove and green apple peel. More sweetness from honey and pears. A touch of chocolate and banana. I wouldn't be surprised if the majority of the Highland whiskies matured in ex-bourbon casks before being transferred to Madeira casks. Lots of wood and nutty flavours. Hazelnut and chestnut. Bitter orange peel brings balance to the whisky. With water, there's a meaty evolution. A vintage starter: Prosciutto wrapped around melon. Nuts, pears and vanilla. Finish: A nutty aftertaste. Melon, nectarine or peach and grapes. Wemyss Malt's Velvet Fig is often used as a reference when it comes to blended malts. 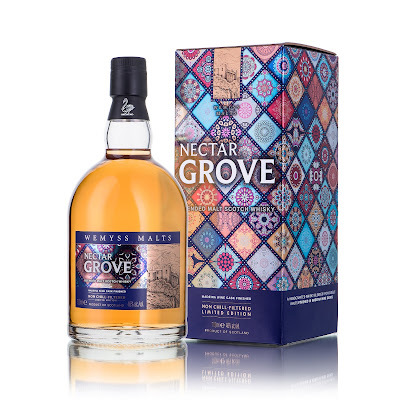 I wouldn't make a bold statement such as "move over Velvet Fig", but Nectar Grove comes really close to it. 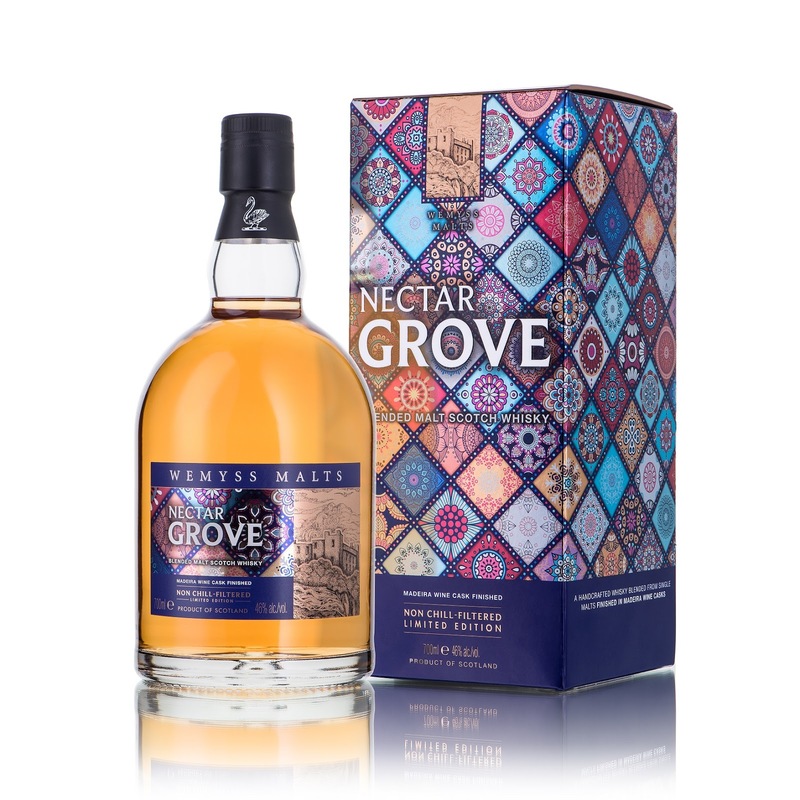 The fresh and fruity notes giving it the quality of a summer dram that can be enjoyed on its own or even in a fruity Cobbler cocktail. I still have a small measure left so I might be trying one Cobbler recipe. Quite a challenge given the number of recipes Google spawns... I'm open to suggestions! Sample disclosure: A sample of Nectar Grove was provided by Wemyss Malts. It has been a while since there has been a Catching up post. Or any decent blog post for that matter... Family life and work have been fairly demanding the past few months. And it looks like there’s a lot to catch up with. 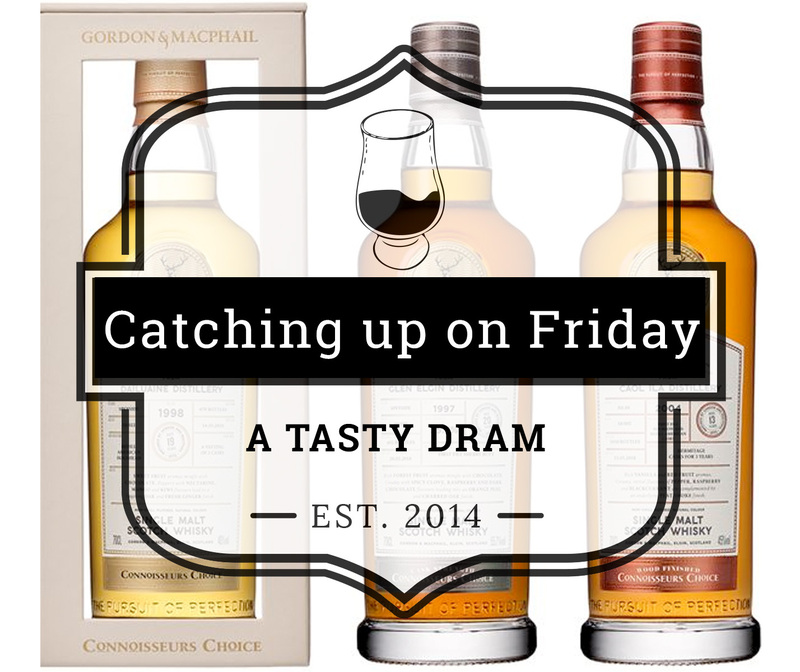 I'll try to get you up to speed in less than two minutes on the latest whisky news, rumours and interesting blog posts from the past week.